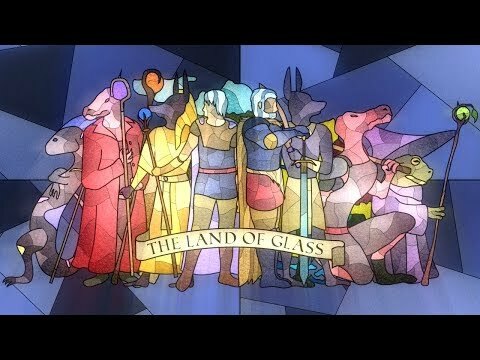 The Land of Glass is a new kind of card game, one where combat doesn't go back and forth in precise turns but operates in real time. The strategy and synergy of typical CCGs is present; however, you'll need more than that to succeed. The monsters won't wait for you to choose your best cards.Combat takes place over two ever-changing grids: attack and defense. Punish your foes with big, heavy blows or swift strikes while countering with a steady stream of defense cards. Use magic to infuse your attacks with fire, ice, explosions, and more; lay traps; burn away defenses; and slow your opponents down for some needed breathing room.Magic is not confined to simply attacking and defending, though. Alter the playing field itself with massive spells, from fields of fire to lightning storms to man-eating plants. There are nine different types of magic to find, and experimenting is key to survival. A knight is sent on a quest he cannot complete. A misfit believes he has ended the world. A mage searches for answers. A blacksmith demands revenge. The portals were supposed to make Vitrerran a better place. They were supposed to save the continent, to unite a divided people. Instead, they brought ruin. Instead, they brought monsters.The Land of Glass is an RPG with eight protagonists spanning four campaigns. Each character is forced to explore the world for the first time, to confront his biases and misconceptions as he tries to stop a magical plague that threatens to eat the continent. While set against an apocalyptic backdrop, The Land of Glass tells stories that are both personal and small—it is a character study first and an epic fantasy second.Because not every quest is noble, and not every world is worth saving.